The Appeal of the "Underdog"
It’s so exciting to be in Costa Rica this summer, with the national soccer team carving out its little piece of history in the World Cup. A couple weeks ago, even Costa Ricans were doubtful that their team would make it past the first round. Group D, which included Uruguay, Italy, and England, was popularly referred to as El Grupo de la Muerte, or “The Group of Death”. Then on June 14th, Costa Rica defeated Uruguay with a stunning 3-1 win. Since then, the entire country has watched each game with bated breath, and celebrated each victory with increasing confidence and enthusiasm. I watched yesterday’s game against Greece on a small, old-style television set here in Las Cruces. We were a modest group, but we packed the room that was available to us. Many NAPIRE students and mentors opted to travel to nearby San Vito to see the event in restaurants and bars. It was a long and difficult game; toward the end our collective experience degenerated into a series of groans and cheers. We were all sweating so much our little room began to smell like a futbol locker. When Keylor Navas deflected Greece’s fourth shot, everyone in the room fell silent. Those seconds while Michael Umaña stepped forward, set down the ball, and prepared for his kick were probably the longest I’ve ever experienced during a soccer game. Then in split second, it was over. The ball shot past Karnezis, and Costa Rica had won. Shouts, dancing, and hugs exploded not only in our little TV room in Las Cruces, but across the nation. 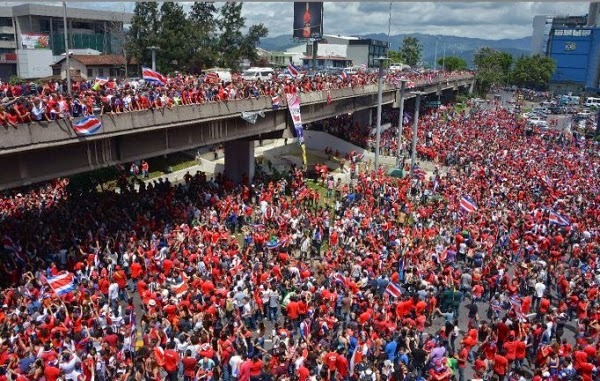 For hours after the game, one could watch televised reports of the riot of celebration that took hold of Costa Ricans everywhere. I’ve sung the praises of Costa Rica many times and for many reasons. Once again I’m impressed by how this little country holds in own in the big leagues, in politics, conservation, and now in sports. Not without effort, and certainly not without cost. But always with a sense of joyful determination, a passion for the game that often pays off. of the major intersections of San Jose. As a Gringa, I sometimes think my own country has lost something along the way when I witness events like these. We no longer seem to have national projects, not even in sports, that pull us together as a nation, and the fill us with shared joy when an extraordinary goal is reached. The Olympics used to fill that hole, but those games don’t seem to resonate among Americans like they used to when I was a little girl. The Space Program was another effort that brought the nation together decades ago, but that too has fallen out of fashion with the current generation. Tomorrow, the U.S. team will play Belgium in the World Cup, hoping for its own spot in the Round of Eight. I’ll be watching that game with baited breath, too. I hope we win, but even if we do, I know the party back home won’t be nearly as good as yesterday’s party in Costa Rica. …Let me just close by saying that I simply must use the name Keylor in one of my future fantasy novels.